Bhai Nand Lal Goya Ji (1633-1713) was a great scholar of Persian and one of the most magnificent highly respected 52 poets in the Darbar of Guru Gobind Singh Ji. Bhai Nand Lal Ji found divine bliss at the lotus feet of King of King, Guru Gobind Singh Ji Maharaj at Anandpur Sahib, where he presented Bandginama Book love of God and devotion to Guru Jii. Guru Ji enjoyed the writings so much and changed its title to Zindginama (Book of Life). Bhai Nand Lal Ji was a devout disciple of Dashmesh Pita JI and his poetry of love and mysticism holds a unique place of honour and had a prominent role in the Darbar of Guru Ji. In one of Bhai Nand Lal Ji poetry compilations called Ganjnama (Treasure Book), he pays homage and cultivates the deep personal devotion to Guru Ji and describes the beautiful, royal and radiant personality of Guru Gobind Singh Ji. 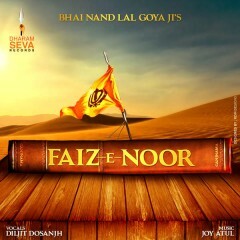 Dharam Seva Records would like to express our deep sense of gratitude to Diljit Dosanjh for his continued support and taking time out to record this special Vaisakhi single ‘Faiz-E-Noor’ in absolute loving praise of Guru Kalgidhar Patshah Dhan Dhan Guru Gobind Singh Ji.